Arsenal’s goalless draw with Southampton leaves them in fourth place in the Premier League with a whole lot to do, with all their title rivals winning. Their failure to score wasn’t due to a lack of trying though, and as these video highlights courtesy of All Arsenal show, they created plenty of chances. A disappointing night ended in stalemate at the Emirates, and we were unable to get the better of a resilient Southampton side. There were some surprises in the lineup, with Per Mertesacker left out and Mathieu Flamini rather bizarrely included. Alexis Sanchez started his first Premier League game since his return from injury, while Mesut Özil was back after being handed a rest over the weekend. The game started brightly for both sides, with Southampton earning a couple of set pieces that came to nothing before Alexis and Özil combined to create what would arguably prove to be the best chance of the game. The Chilean’s long ball over the top was perfect for the German playmaker to run onto, and his touch to bring it under control was sublime. He killed it dead effortlessly, and was painfully unlucky to see his snap shot saved by the outstretched leg of Fraser Forster. Southampton were looking dangerous, and we were left exposed by their pace and movement on occasion. You have to think Mertesacker would have struggled with the likes of Shane Long and Sadio Mane, and that fact may have helped Arsene Wenger choose his starting lineup. Despite those moments of danger though, it was us – and Özil – who got the next clear cut chance. Olivier Giroud rose above the defence to flick on a cross, with Özil reading it superbly and making the run. He got an outstretched toe on the ball, but was somehow denied by Forster. The English keeper didn’t know much about the save, but got an outstretched hand on the ball as it threatened to whip past him. We failed to really craft too much more of note in the first half, and it was Southampton that looked the more threatening. Petr Cech was called on a number of times to keep the scores level, although none of the saves were particularly taxing and you’d expect a keeper of his quality to make them all. It was his calmness and composure in the box that was most appreciated though, as with defensive mistakes creeping into our game, he kept us looking solid. We went into the break with the scores level, but there were signs that the second half was capable of producing goals; how wrong those signs were. After a string of mistakes from both sides early on in the half, Olivier Giroud was denied what he thought was a certain goal, with his curling effort looking destined for the back of the net. You could see the look of disbelief on his face as Forster tipped it over, and he fell to the ground with his head in his hands. We were piling on the pressure now, and Alexis Sanchez and Mesut Özil were combing superbly. A great move allowed the World Cup winner to get into a great position to cut back, but there was nobody in the right place to capitalise, and Joel Campbell eventually skied it over. 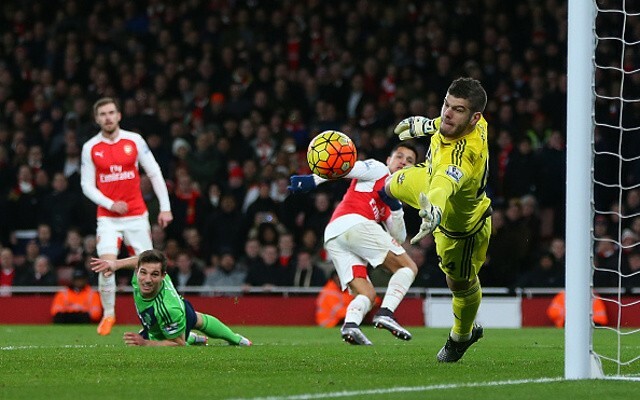 It was the Fraser Forster show after that, with the Saints shot-stopper making save after save. Not all of them were world class by any stretch, but he consistently did enough to deny us. A couple of Giroud headers, an Alexis Sanchez salmon leap, and a close range effort from the former Barcelona star were all kept out by the former Celtic man, before he made a key double save from second half substitute Theo Walcott. The speedster really should have done better with the first effort, but they were great saves nonetheless. Things weren’t helped by the keeper, who was continuously calling Southampton up for small fouls, but never booking anybody. He was also letting some stupidly physical challenges go, but obviously as soon as Francis Coquelin came on he was given an instant yellow card. That’s not saying the tackle wasn’t deserving of a yellow, but the complete lack of consistency from Lee Mason throughout the game was astonishing. There was one more chance late on – Alexis and Özil key yet again – but Virgil van Dijk made a great last ditch tackle to deny our record signing. In the end we couldn’t break the deadlock, and with Manchester City, Tottenham, and Leicester City all winning, the point we gained sees us sink to fourth place.